Football fans travelling from Asia to watch their beloved teams like Manchester United or Liverpool is nothing new. 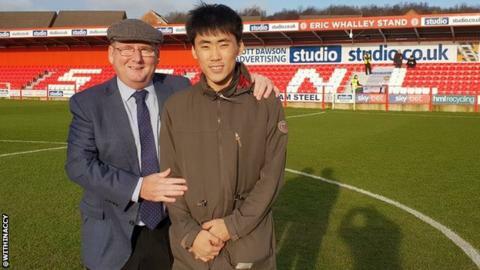 But one supporter from South Korea has taken his commitment to the English game to another level by jetting more than 5,000 miles to see Accrington Stanley. The League One club might not necessarily be the obvious choice among fans in east Asia, but for Jung Min Yoo, they are his number one team. The 25-year-old student from Seoul started following Accrington in October 2017 after reading a BBC Sport article on how chairman Andy Holt runs the club. Jung Min's first trip to the Wham Stadium on Saturday was not to be a memorable one in terms of the result as Stanley were swept aside 4-0 by Peterborough United. However, events on the pitch would not dampen his day. "The result was terrible, but I enjoyed watching the football and meeting amazing fans," he told the Lancashire Telegraph. Before the game, the chairman took him on a guided tour of the stadium before sharing a pint in the supporters' bar with him at full-time. Jung Min also met with players including goalkeeper Connor Ripley who presented him with a pair of his gloves and boots, plus manager John Coleman and lots of fellow Stanley supporters. "I'm proud to say Stanley is becoming a worldwide brand," Holt said after meeting the committed fan after the game. Jung Min has shown his dedication to Stanley by purchasing a £264 season ticket even though he is only seeing a single league fixture. However, he is also set to watch Stanley's FA Cup third round tie against Ipswich on Saturday during his stay in the UK. As well as the football, he has also been tweeting about enjoying some sights of the north west, including admiring some of the older buildings in nearby Ramsbottom.